Your guests will be impressed when you bring out this beautiful tea box so they can select from your personalized collection of teas. This tea chest holds over 120 bags of tea! The convenient side drawer holds all your accessories so the tea extras are easily found. The drawer is removable and can be passed around the table for easy use by everyone. Your guests will be impressed and you can relax! Family values! Enhance the time you relax together as a family sipping warm tea, after supper or a long day's work. Our tea chest will infuse beauty into an already beautiful time. Organization! No more digging through your cupboards and sorting through boxes for your favorite flavor of tea. Our tea chest holds all types and sizes of teas- standing up or laying down flat. From the large brand bags to the funky shaped bags, our tea chest fits them all. No need for slanting the bags. Deep compartments allow for tea bags to stand up and the lid still closes all the way! 6 deep compartments and 2 shallow ones allow you to rotate your tea collections as flavors run low. Cleaning this tea chest is a breeze! Compartment dividers remove and the drawer pulls out all the way so the entire box can be wiped down easily, inside and out, for quick cleaning. Unlike wood, bamboo can be cleaned with just a bit of warm water without fear of staining or swelling. Family Home: Tea chest is compact and sturdy enough for graceful display in kitchen, dining room or living room coffee table. 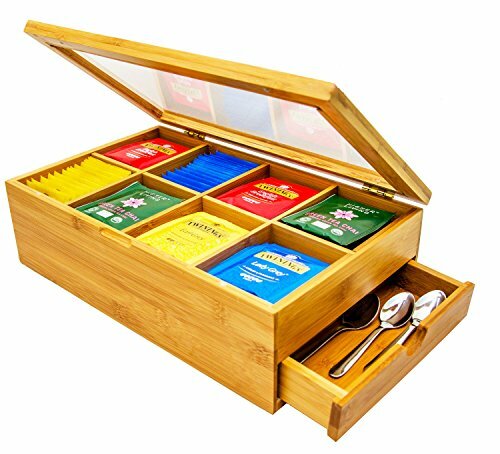 Office:The handsome appearance of this tea chest will add polish and organization to your break room. Holds over 120 bags of tea and coffee packets. Restaurant: This tea chest will add elegance and style to your place of business! ✅ QUALITY CRAFTSMANSHIP. Unlike other cheaply made models.LIMITED TIME OFFER 29.90!!! (NORMAL PRICE 49.99!) Elegantly handcrafted from Eco friendly bamboo. Stain free, splinter free and sturdy smooth construction. Clear framed lid formed from acrylic glass allows for CRYSTAL clear easy viewing of your beautiful tea collection. Acrylic glass is shatterproof and safe for kids. Magnetic points keeps tea chest lid closed and tea fresh. Notched groove by lid area for easy opening. ✅ SMART DESIGN! Deep, divided compartments comfortably holds over 120 bags of tea! Lid closes all the way, even when bags are standing up, unlike the standard shallow design of other tea boxes. Stay Open HINGED LID is an original special feature Sugarman Creations designed for our customers. Our lid stands open while you select your tea bag, unlike other Tea Box models whose lid falls fully backwards. SLIDE OUT DRAWER perfect for storing all the tea extras! ✅ PERFECT GIFT for moms, grandparents, housewarmings, bridal showers, girlfriends, co workers, bosses. Or even just for yourself. Perfect for home, office or restaurant use! Tea bags not included. ✅ VERSATILE, CUSTOMIZABLE AND EASY TO MAINTAIN---Unlike other identical models Sugarman Creations is THE ONLY TEA BOX with Dividers that are removable so you can customize the inside tea box space. Tea chest is simple to clean with a bit of warm water and soap. Another plus- this tea chest can also be used for storing crafts, trinkets, accessories or small collections. ✅ BENEFITS OF BUYING FROM SUGARMAN CREATIONS: 1). 100% SATISFACTION GUARANTEED. We stand behind the superior craftsmanship and high quality design of our tea box. Our tea chest is sure to infuse elegance, comfort and ease to your favorite cup of tea. 2) By purchasing from us, you will be supporting a small, Delaware based, family-owned business. We also donate 10% of all our profits to charity, so with your purchase you will be supporting a good cause! If you have any questions about this product by Sugarman Creations, contact us by completing and submitting the form below. If you are looking for a specif part number, please include it with your message.